Many children with autism spectrum disorder need assistance with their listening, language, and whole-word reading skills. 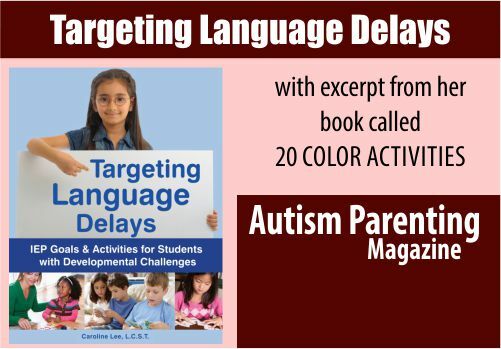 The book, Targeting Language Delays: IEP Goals & Activities for Students with Developmental Challenges, written by Speech-Language Pathologist Caroline Lee, sequentially teaches these vital skills using more than 100 goals and activities that can be used at home as well as incorporated into an Individualized Education Program (IEP). The book is intended for the use of speech-language pathologists, parents, teachers, support personnel, volunteers and others working with school-age students who have mild to severe delays in the cognitive and language areas with or without characteristics on the autism spectrum. Lee has provided Autism Parenting Magazine with an informative excerpt from her book called, “20 Color Activities” which is the “Carryover” section from Targeting Language Delays Chapter 8 Descriptors Goal 1: “The student will understand and use the names of primary colors (with 80-90 percent accuracy).” This goal follows the same structure as for all of the 100 plus sequential IEP goals presented in this book. The materials needed to teach the goal are listed followed by a clear and concise description of how to develop the understanding and use of the target language in a structured setting (in this case, the understanding and use of color names). Activities to encourage the student to “carryover” (generalize) the target in spontaneous communication in everyday life are listed at the end of each goal. Goals are presented in 17 different areas including nouns, verbs, concepts, categorization, word and sentence structure, ‘Wh’ questions, ‘yes/no,’ ‘same and different,’ listening skills and whole-word reading. 3. Have only the target colors available for craft or painting activities (crayons, paints, pom-poms). Have the student ask for the color she wants. 4. Put craft supplies, treats, or other desirable items in different-colored containers—have her name the color correctly to get the contents. 5. Go on a Color Walk—name everything you see that is of the target color. 6. Read storybooks that refer to target colors; e.g., Brown Bear, Brown Bear, What Do You See? by Bill Martin Jr. and Eric Carle. 9. Fix a paper square of the target color to the doorframe of the classroom—have the student touch it and name the color each time she goes in or out. 10. Sort items by color into containers labeled with the color name—foam shapes, Lego pieces, pegs for a pegboard, bingo chips, pipe cleaners, pom-poms, crayons, and markers. 11. Make a color collage of pictures from magazines and catalogs. 14. Play Tiddlywinks—using counters of the target and contrasted colors. 16. Paint by numbers. Write numbers on areas of an ability-appropriate coloring sheet; e.g., picture of a flower or car. Write out a key; e.g., 1 = blue, 2 = green, etc. Have the student color the picture using the designated colors; e.g., blue for wheels; yellow for body of car. 17. Play Lotto, Memory, Go Fish, Fishing, and Snakes/Chutes and Ladders using colors. 18. Play Snap to work on the colors red and black or make cards of other target colors. 19. Make a collection of things that have 2 colors on them; e.g., leaf—yellow and red; T shirt— blue and brown. 20. Play commercial color sorting/matching games, computer programs, and apps. 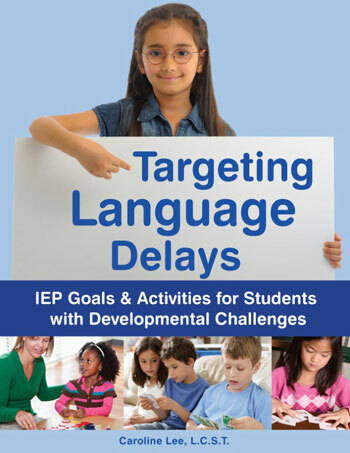 An excerpt from Targeting Language Delays: IEP Goals & Activities for Students with Developmental Challenges by Caroline Lee (ISBN: 978-1-60613-201-2). Printed with the permission of Woodbine House, Inc. The book is available in the US through http://www.woodbinehouse.com ($26.95 US) and in Canada ($32.95 Can) through http://www.monarchbooks.ca and other online book suppliers. Caroline Lee is a retired speech-language pathologist with extensive experience providing language therapy through support personnel for school-age children with developmental challenges including autism.